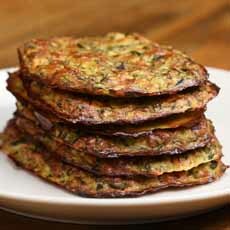  Zucchini and onion hash browns (photo courtesy Tasty). Grated zucchini using a box grater (photo courtesy DVO). 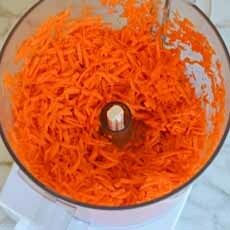 Grated carrots using a food processor (photo courtesy Once Upon A Chef). If your palate says Hash Browns! but your mind says Cut Carbs!, here’s a solution: Substitute grated carrots, zucchini and/or chopped spinach—or a combination—for the potatoes. You save the potato carbs and, because these hash browns are baked, not sautéed/pan fried*, you save the fat, too. This recipe, adapted from Tasty, uses an egg and grated cheese to bind the grated vegetables. You can serve them with eggs and/or breakfast meats, enjoy them as a vegetarian lunch with condiments of choice and a salad, or serve them as a side with dinner. 1. PREHEAT the oven to 400°F/200°C. Place a baking sheet in the oven as it heats. This added heat will make the hash browns crisper. 2. 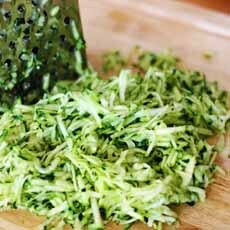 USING a food processor with the coarse grating blade, or the coarse side of a box grater, grate the zucchini or carrots, as well as the onion, on the coarse side. If using spinach, see the *footnote below. 3. PLACE the grated zucchini in a large bowl and sprinkle with salt. Blend and set aside for 20 minutes; the salt will draw moisture from the zucchini. Then transfer the zucchini to paper towels and press lightly to remove the remaining moisture. 4. RETURN the zucchini to the bowl and toss in the remaining ingredients. Mix until well combined. Form the mixture into 6 patties. 5. REMOVE the baking sheet from the oven and line with parchment. Place the patties on the baking sheet. Bake for 35 minutes, turning halfway through, until golden brown. 5. REMOVE from the oven. If the patties are too soft, let them cool for 10 minutes, to set. *Sautés and pan-frys are almost identical. The only meaningful difference is that in a sauté, the food is cut into small pieces, like sautéed mushrooms. A pan fry denotes larger pieces, like a chicken breast. †When sliced, 1 medium zucchini yields about 1 to 1.25 cups. If grated, it yields about 2/3 cup of tamped down zucchini. Thus, 2 medium zucchini equals 1-1/2 cups of grated zucchini. It takes about 2.75 medium carrots to obtain 1 cup of grated carrots. Thus, plan on 3-1/2 carrots. One package (10 ounces) of frozen chopped spinach yields about 1-1/2 cups after cooking, but to eliminate all the water and tamp down, plan on two packages. Information from How Much Is In.